in the dustbin, correction – plastic recycling bin. This year we are growing potatoes re-using those plastic compost bags – an idea we picked up from one of Monty Don’s Gardener’s World videos on the BBC website. We have been keeping the bags back as they are heavy duty plastic – each bag only needs three potatoes to grow a crop – and the results are so delicious and so economical. We turn the bags inside out so they are less obtrusive and they are behind an open fence as they are not the most beautiful sight to behold. Here’s the latest bag we have used that contained peat-free compost. 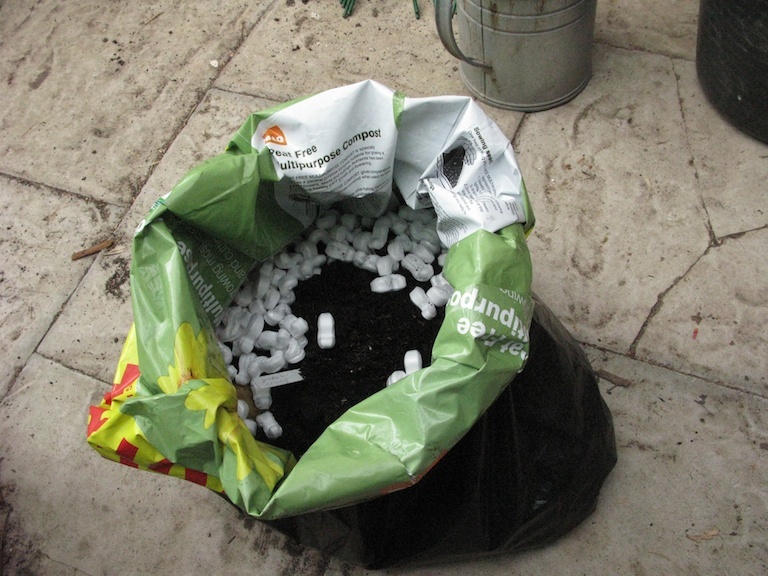 We have added some polystyrene pieces that seem to give plants added vigour. Not sure why, but it is true. Another suggestion is to use several rubbish or gardening sacks one inside the other, more than one to get extra strength, a bit like carrying wine bottles using more than one plastic carry bags. We’ll be experimenting with hessian sacks to see what we can grow – we got this idea from the charity Send A Cow who promote bag gardens – see the video. Do you have an economical tip to pass on?